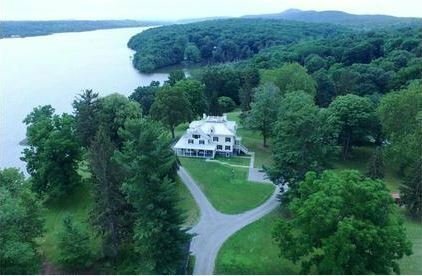 Rare offering, only 20 minutes from Metro North and 90 minutes from Manhattan. Featuring majestic 180 degree Hudson River views and direct Hudson River access, this 8000 SF 3-story residence has been renovated and restored with careful attention to its original details and historic character while also fulfilling modern day priorities. Beautifully sited on a terrace 50 feet above the Hudson with sweeping views from the expansive 1600 SF porch and the interior of the mansion, you will find gleaming oak and parquet floors throughout, original woodwork and custom carpentry, formal living and dining rooms, warm library, and 5 generous bedrooms with luxurious baths. The lower level provides additional space perfect for studio, office or extended entertainment space. Included is a warm and welcoming guest house, which checks all boxes of today’s taste, featuring many original 1840 features with a contemporary kitchen and 2 updated baths, great for guests, family or staff. There are four working fireplaces in the mansion with another 4 ready for improvements on the second floor. The roof was replaced with lead coated copper, an extremely durable roofing material with a long lifespan suitable for historic buildings. In addition, there are several well preserved outbuildings - ice house (being used as a garage), stone incubator and smokehouse. The Alton B. Parker House is architecturally significant as a distinctive example of a Hudson Valley mid-19th century country house. This is a truly magnificent Hudson River compound.